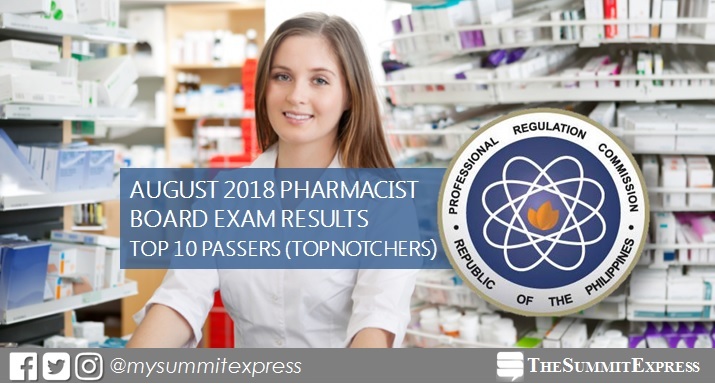 MANILA, Philippines – The full list of topnotchers or top 10 passers in the August 2018 Pharmacist board exam is available on this page as officially released on Wednesday, August 8 or in three (3) working days after the exam. Louise Tan Theunis of Cebu Doctor's University (CDU) led the passers with 91.55%. Euriel Jasmin Pakinggan Caparas of Centro Escolar University (CEU) - Manila ranked second with 91.40%. The Professional Regulation Commission (PRC) conducted the second board exam for pharmacists this year on August 4 and 5 in Manila, all regional offices and Zamboanga. In the same period last year (August 2017), Jannylene Rose Tolentino Chua from University of San Carlos (USC) aced the board with 91.10%. It was followed by Kimberly Tan Lomantas of University of the Immaculate Conception-Davao and UP Manila alum Genmar Cyrus Sael Pasion, both having 91.05%. In the June 2016 exams, John Bryan Guadalupe Ruba of University of the Immaculate Conception-Davao topped the board with 92.85-percent grade. Our Lady of Fatima University - Valenzuela alumna Jennilyn Daza Yambao ranked second with 92.80%. Monitor this page for the real-time updates on Pharmacist board exam results. Check out also the official website of PRC for more information.